Dixiane Hallaj is a particular good writer of social/historically placed, politically pointed, drama, both in her creative fiction and as in this case in the writing of Biography augmented with fictional reality. In fact, most biographies contain some invented content, and/or augmented interpretation. There are going to be gaps to fill in any knowledge that reports anything deeper than the bare historic/factual bones. Hallaj writes, very-broadly speaking, women’s literature, in that central female figures and through them family, are her bread and butter. That shouldn’t deter any but the most misogynistic of male readers. There is plenty of the gritty content and adventure to balance the childcare and dressmaking. This is a lot on female, and male, sensitivities, but certainly very little sentimental. Lola had as psychologically tough a life as most male heroes, and survived an extraordinarily mixed bunch of husbands and other male figures. I may have lost count, but she had certainly buried at least two husbands and saw off another by the time she was thirty. Well, to be accurate, the exes were never conventionally buried. Hallaj has preserved for history a very informative piece of family/social history. She literally saved important social history from a death bed. This is the history of a very ordinary daughter of gentry, turned extraordinary by the turmoil that swirled through and around her life. Lola saw plenty of the poverties and hardships as well as at least spells of grandeur living. We learn a very great deal about the life experiences of people in Latin America and further afield, between the end of the 19th century and the start of the Great Depression. We leave Lola’s life when she was still hardly middle-aged, by which time she had as much life experience as a half dozen others might achieve in half a dozen centuries. 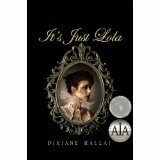 Hallaj has blended biography and real life fiction to create a wonderful memory of her grandmother from her mother’s own words. The writing is of a very high quality, the script is captivating, and we learn as much about Lola’s times as we would from the very best of historical documentary. What is more, Hallaj seems to be able to paint incredibly detailed pictures without ever seeming to use more than the fewest of words to do so.